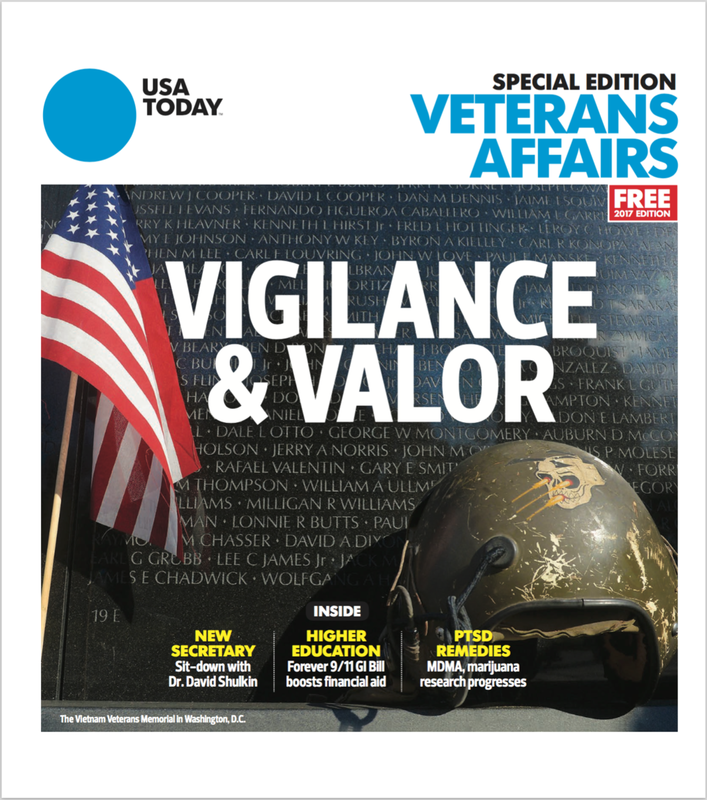 Read a great article by Ryan Gardner, a clinical social worker who runs the Veteran Photo Recovery Project with founder Susan Quaglietti, in the Fall 2017 edition of the Association of VA Social Workers Newsletter. We’re excited to announce that “Visions of Warriors” will be screening at the closing reception of the “Seeing Hope: Veteran Recovery Project. It’s not just for PTSD” Exhibition at the City of Palo Alto/Cubberley Artist Studio Program (CASP) Open Studio Event on Saturday, 11/18/17, from 3:00 p.m. - 7:00 p.m. in Palo Alto, California. The exhibition, which runs from 11/4/17 to 11/18/17, showcases an inspiring collection of Hope Books, containing photography and prose created by veterans in the Veteran Photo Recovery Project. Both the screening and exhibition are part of a two-week-long Open Studio Event in honor of veterans, coinciding with Veterans Day. See the City of Palo Alto press release below for a complete schedule. According to their site, “The Cubberley Artist Studio Program (CASP) supports the vitality of the arts in Palo Alto by providing City-sponsored, affordable studio space for artists, building creative community and fostering public engagement with the arts and artists.” Thank you to Conrad Johnson, the Cubberley Artist Studio Program, and the City of Palo Alto for this huge honor. We’re pleased to announce that the Colorado Psychiatric Rehabilitation Association (COPRA) will be hosting a screening of “Visions of Warriors” in Denver, Colorado as part of their recruitment event. We had the huge honor of screening our film at the Psychiatric Rehabilitation Association’s 40th Annual Wellness & Recovery Summit. Now we have the privilege of showing it at the Colorado chapter of the Psychiatric Rehabilitation Association (PRA). According to their website, “PRA is the premier source of learning, knowledge and research for the psychiatric rehabilitation profession.” According to the Dahlia Campus for Health & Well-Being—Mental Health Center of Denver’s site, they “provide a place for community members to connect with their neighbors, learn new skills and find supports they need to increase their health and well-being.” We deeply appreciate the PRA’s continuing support of our film. Thank you to Raymond Sedillo, COPRA, PRA, and the Dahlia Campus for Health & Well-Being—Mental Health Center of Denver for organizing this screening. 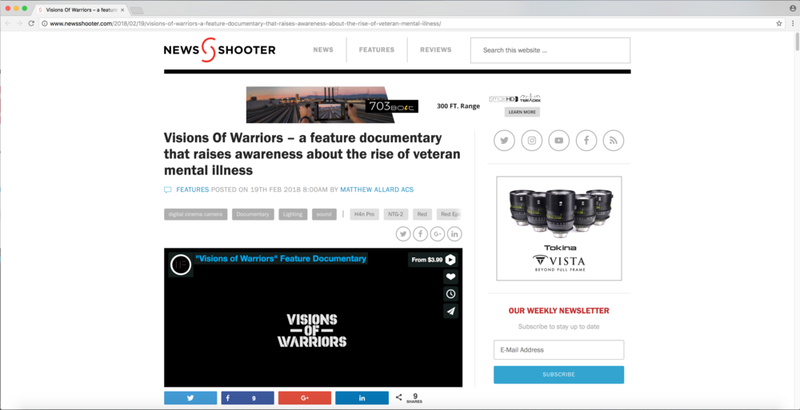 Susan Quaglietti, the founder of the Veteran Photo Recovery Project and one of the subjects in the feature documentary “Visions of Warriors,” is covered in Dominican University of California’s news. Susan received a M.A. in Humanities at the historic university, founded in 1890. Her studies there helped inspire her to create the Veteran Photo Recovery Project. 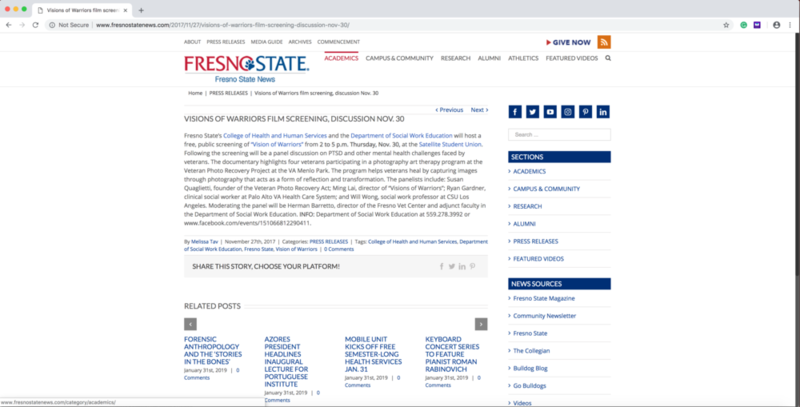 The university will be hosting a screening of “Visions of Warriors” as part of its Democracy and Equity Initiative, sponsored by its School of Liberal Arts and Education and its departments of Psychology, Health Sciences, and Nursing.